Did Kerry Call for Bombing Syria? If so, President Obama ought to fire him. When I’m wrong, I’m wrong—and I’ll admit it. I was wrong about John Kerry, President Obama’s secretary of state. I really did think that he’d instinctively put diplomacy above war, but he’s failed the first real test, in Syria, and he’s failed it badly. I overestimated him. Some senior State Department officials have been pushing for a more aggressive military response, including airstrikes to hit the primary landing strips in Syria that the Assad government uses to launch the chemical weapons attacks, ferry troops around the country and receive shipments of arms from Iran. But White House officials remain wary. Flash-forward to this past Wednesday. At a principals meeting in the White House situation room, Secretary of State John Kerry began arguing, vociferously, for immediate U.S. airstrikes against airfields under the control of Bashar al-Assad’s Syrian regime—specifically, those fields it has used to launch chemical weapons raids against rebel forces. It was at this point that the current chairman of the Joint Chiefs of Staff, the usually mild-mannered Army General Martin Dempsey, spoke up, loudly. According to several sources, Dempsey threw a series of brushback pitches at Kerry, demanding to know just exactly what the post-strike plan would be and pointing out that the State Department didn’t fully grasp the complexity of such an operation. If that story is true, it ought to be grounds to fire Kerry. Syrian rebels said Friday that newly arrived shipments of heavy weaponry could swing the momentum on the battlefield in their favor, after a shift in U.S. policy opened the door for others to send them arms. White House officials refused to comment Friday on a Los Angeles Times report that CIA operatives and U.S. special operations troops have been secretly training Syrian rebels with anti-tank and anti-aircraft weapons since late last year, saying only that the U.S. had increased its assistance to the rebellion. Assad’s forces are still making gains across Syria, after taking control of a strategic, rebel-held town, Qusayr, near the Lebanese border and moving toward rebel-controlled areas around Aleppo and in the Damascus suburbs. It isn’t clear, yet, if the US arms and the Saudi-Qatar arms pipeline can turn the tide. But it will certainly make things in Syria bloodier. As for Mr. Kerry, he has made clear from the time he joined the administration that he is not one to air his advice to the White House in public. At his first meeting with his staff on the seventh floor of the State Department, officials say, Mr. Kerry used a Boston sports analogy to explain his role in the administration. The secretary of state would be like Bill Walton, the basketball star who helped the Celtics win a championship, and would help the Obama team by creating shots and passing the ball at the right moment. “There’s no more ‘me,’ only ‘we,’ ” he told his aides. I hate sports analogies when it comes to matters of war and peace, or life and death, and Kerry’s Bill Walton reference leaves me cold. 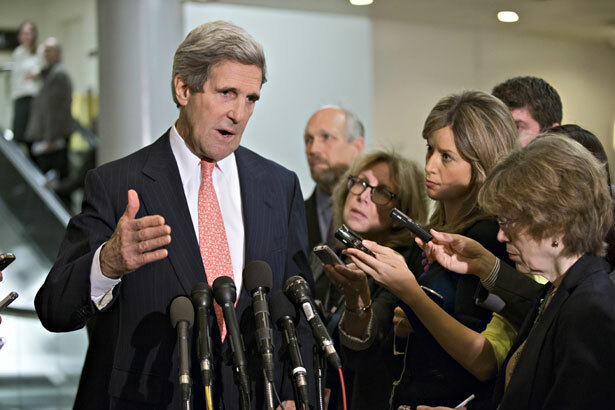 In time, Kerry may make Hillary Clinton, the hawkish former secretary of state, look like a quiet dove. Greg Mitchell reminds the administration—and the media outlets that continue to report its claims without question—that the public still opposes intervention in Syria.